In recent times, the word ‘authentic’ has been used loosely when it comes to food. Have you come across ‘authentic’ French food cooked by Chinese? How authentic can it be? Thankfully, Thai Goldmine Kitchen, located along Kitchener Road, serves legitimately authentic Thai food cooked by native Thai people. Keep your eyes peeled as you walk along Kitchener Road, or you might miss this restaurant. The posters stuck onto the glass door might catch your attention, especially if you’re hungry and in the mood for Thai food. Stepping through the doors reminded me of my recent trip to Bangkok; the soft Thai music playing in the background and the interior made it feel like an authentic Thai eatery. We couldn’t help but notice the writing on the wall. Many customers left compliments, both for the food and for their service. Feel free to read through the notes while waiting for your food to arrive! We started off with some Homemade Thai Prawn Cakes ($10). These donut-shaped appetisers definitely made my mouth water when it arrived at our table. The soft crust still retained a slightly crispy layer. What I absolutely loved about it was that it wasn’t very oily because it was only lightly fried. Biting into the Homemade Thai Prawn Cakes revealed the minced prawn filling which had a texture that resembled a fish cake. Are you a fan of tom yum soup? Then you’ll love the Charcoal Pot Tom Yum Seafood ($18). Made with lemongrass, bird’s eye chilli and coriander, it was one of the best tom yum soup I’ve ever tasted. As the name suggests, the Tom Yum Seafood was constantly heated by charcoals placed in the centre of the pot. There are two types of tom yum soup to choose from, either clear or thick. We had the clear soup, which was clean and smooth with a watery consistency. The spiciness of the soup didn’t overpower the tom yum aroma. The dish also came with a generous portion of fresh seafood, including fish and prawns. A steaming tray of Steam Seabass With Lemon Sauce ($20/small, $30/big) arrived next and the size of the Steam Seabass took us by surprise. We ordered the small portion but the fish given was actually quite big. I can’t imagine how big the fish will be if I ordered the large size instead! The gravy was sweet and piquant, a familiar taste when it comes to Thai cuisine. We found the dish too fishy for our liking though and the taste lingered in my mouth even after drinking some water. I really enjoyed the amazing flavours of the Thai Spicy Long Beans With Pork ($10). The basil leaf in the curry lifted the dish with its fragrance. As I placed a soft and succulent piece of pork, smothered with the sweet and salty curry gravy into my mouth, I tasted a multitude of spices. The Thai Spicy Long Beans soaked up the curry gravy, releasing the flavours with every bite I took. If you want some carbs, you can also order a bowl of rice to go with this dish. If you can’t do without rice, you should try the Green Curry Fried Rice ($5.50/small. $8.50/big). We tried the small portion but it was more than enough for us. The green curry flavour was quite distinct, and the spices were well-infused into the rice. The rice was slightly sticky which I liked because it gave the dish additional texture. I could really taste the complexity of the dish when I placed a spoonful of rice into my mouth. A multitude of flavours was introduced to my taste buds one at a time. From the spiciness of the chilli, to the green curry, to the fragrant spices, it was a never-ending treat. We started on desserts with the Thai Mango Salad ($6). The dish came with a generous amount of shaved green mango, topped with crunchy peanuts and drizzled with a sweet and sour sauce. Digging into the Thai Mango Salad was a tantalising experience. The crunchiness of the fresh Thai Mango Salad and the slight spiciness tickled my tongue as I ate. The sweet and sour sauce also blended well with the flavour of the shaved green mango. The ever-popular Mango Sticky Rice ($6), the epitome of Thai dessert, was what we had to conclude this food adventure. You can never go wrong with this delectable dessert. The warm sticky rice, together with the cool and sweet mango, was a match made in heaven. The mango was so soft that it practically melted in my mouth! The nutty aroma from the coconut milk also helped to enhance the flavour of the dish. Now, you don’t need to travel to Thailand for authentic Thai food. 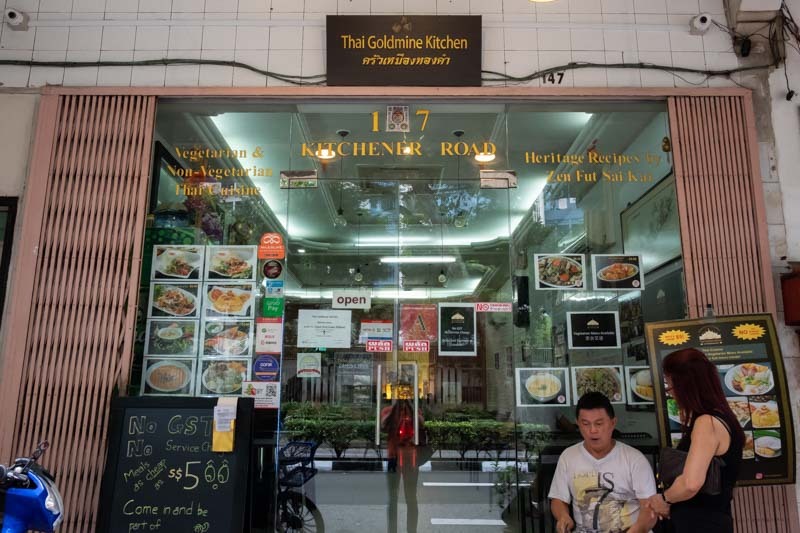 Just take a trip down to Thai Goldmine Kitchen to enjoy the flavours of Thailand in Singapore! Look out for their seasonal desserts as they offer off-the-menu desserts from time to time, so don’t be afraid to ask one of their friendly staff members. You may be in for a surprise!